"Greer Family Clings to 'Shadow' of Hope"
GREER - Hope came quietly on a cold, autumn night as Frankie McGinnis stood in a sanctuary, trying to pray. 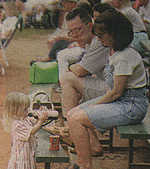 Music played as her 1-year-old daughter, Laura, swayed by her side. Frankie took note of Laura's frail frame. Laura had spent the past year battling a rare disease, the struggle marked by vomiting and shots and X-rays and pain. On this night, Frankie was certain: Laura was getting worse. As the service ended, Laura pointed toward the altar and spoke. "There's Shadow," she said, before she knelt and prayed. Frankie wouldn't understand until months later when she glimpsed a towering figure, with golden hair and arched wings. She would weep, realizing that hope dwells in shadows. Before Laura was born, Frankie had dreams for her daughter -- of ballet classes and boyfriends and making sandcastles on the shore. On March 23, 1996, an 8-pound girl was born. 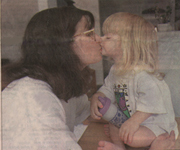 Happy moments: In photo Laura McGinnis gives her mother, Frankie, a kiss after a fingernail-painting session. Sometimes, Frankie can forget that her 2-year-old daughter is battling a rare illness. Laura's condition leaves her constantly dehydrated. Frankie and J.T. McGinnis, along with 8-year-old Christopher, peered at Laura as she tried to lift her head. "She is perfect," Frankie thought. That was the spring when happiness reigned, when the McGinnises knew little of shadows and uncertainty. Two weeks into the infant's life, Frankie and J.T. rushed her to the hospital with a high fever, thinking she had an infection. Explanations and treatments came, but Laura got worse. She constantly vomited -- in the evening, in the crib, in the car while Frankie dropped her son Christopher at Mitchell Road Elementary School. On the way home, Frankie would stop by her mother's house, crying, asking for towels, not understanding what was wrong. Neighborhood children out-grew shirts and shoes, but Laura stopped growing. "It was like somebody flipped a switch," J.T. said. Doctors were searching for answers when the McGinnises found Dr. Lane Robson at the Children's Hospital in Greenville. He took one look at Laura and thought, Cystinosis. The rare disease afflicts 400 to 500 people in the United States. It is a genetic condition that passes silently through mother and father, uniting in the child. Doctors know that those with the disease have problems with an amino acid that can crystallize in the cells and cause organs to shut down. They know some children need new kidneys to survive. They know most don't lead normal lives, and the ones they have are marked by sickness and pain. "You never get any sleep. than you an bear. ..."
As the McGinnises awaited Cystinosis test results from California, Laura needed surgery. Doctors cut a hole in her stomach and inserted a feeding tube. Laura had a fierce reaction to anesthesia. Despite doses of morphine, she turned pale and screamed as the night worn on. Frankie's hope that nothing major was wrong faded as she sat beside her daughter, stroking her hair. The next morning, doctors confirmed Laura had Cystinosis. Frankie collapsed in the hospital, screaming. Later that day, Laura saw her father cry for the first time. She didn't understand why, but she'd had her share of tears and pain. "Here, Daddy," she said, offering her pacifier. At the start, the McGinnises didn't know what they were up against. They still don't, and a frequent refrain from doctors is, "We don't know." Doctors say they've made great strides in recent decades in battling the disease. The development of kidney transplants and a drug called Cysteamine [Cystagon] have increased the life span of those afflicted, doctors say. But much remains unknown, says Frankie, as she stands in her Greer home preparing Laura's morning medicine. The sleepy 2-year-old wipes her eyes, opens her mouth and adjusts her Barney T-shirt. Laura has learned the names of her medicines, saying Zantac or 'tassium (Potassium). Daily, the McGinnises learn. Frankie learns to stifle tears. J.T. learns not to storm through the house, silent and angry. Together, they learn to move on. They went back to work. They bought a new house. They tried to make life normal for Christopher, who knows his half-sister may die. Slowly, they inhabited lives much different than they had planned. "You never get any sleep," Frankie said. "You're always tired. You're functioning with half a brain because the other half is Laura's. ... She's just so little and cute you don't want her to hurt. ... Sometimes I just look at her. It's so much more than you can bear. ..."
Laura gets a drink as J.T. and Frankie McGinnis watch. The McGinnises started poring through medical books and the Internet to learn about the disease. They discovered the national Cystinosis Foundation. They learned that hundreds of families live lives like theirs. The learned that top specialists across the world attend yearly conferences to discuss new treatments. They attended a conference in California. There the McGinnises were normal. They were among parents who knew about vomiting and gave medications by the hour. Frankie told them she felt crazy, and they'd say she was, and they were, too. But Frankie wasn't prepared for what she saw: dozens of people, most with blond hair and fair skin, some of whom had failed kidneys and eye problems and fear. For Frankie, the journey marked a dimming of hope. All possibilities for Laura -- the kidney transplant and new medications -- were exposed in the faces of other who had been there and remained ill.
Last fall, the family attended an evening service at the First Assembly of God on Haywood Road. As the service ended, Laura headed to the altar. "Mom, there's Shadow," she said. Confused, Frankie followed her daughter, who knelt and prayed. The scenario became common as Laura got weaker. She began speaking to Shadow at home. When Frankie asked about the chattering, Laura pointed as if all should see. "Shadow," she said. An invisible friend, Frankie thought. Frankie, Laura and her grandmother, Kathy McGhee, walked through Haywood Mall, shopping for Christmas presents. Laura was refusing to sit on Santa's lap when she pointed to the sky. Frankie looked toward the ceiling at decorations strewn across the mall. Towering overhead was the largest Christmas angel Frankie had ever seen, an opaline figure with golden hair and arched wings. "Laura," she said, as she got chills and began to weep. "That's Shadow?" The McGinnises have realized that hope dwells in shadows, that it emerges quietly and mysteriously when the thought that Laura may die weighs heavily on their minds. That Laura recognized a decorative Christmas angel gives the McGinnises comfort, suggesting a genuine figure appears on her sickest days. But in small moments, the McGinnises forget hope and shadows, reveling in summer afternoons when Laura sits playfully at her high chair, awaiting lunch. "Daddy, feed me," she says. J.T. laughs. He lifts a spoon. "You're showing off, wild woman," he says. She eats. She stops. She refuses another dose of Beanee Weenees. "You're going to sit in that chair until you go to college," J.T. says. Frankie pauses. If only she lives that long. Frankie has learned to accept that J.T. deals differently with Laura's illness. He talks about starting a college fund for Laura. Frankie thinks there may not be a need. J.T. looks at his daughter and says she's more than he ever dreamed. "I'll take what I have," he says. "I've had the most beautiful experience that I could ever have. You can be a happy family, no matter what." 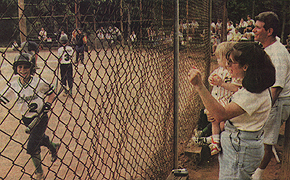 Rooting him on: Frankie cheers for her 10-year-old-son, Christopher, who had just hit a home run. The McGinnises try to make life normal for Christopher, who knows his half-sister could die. For now, the McGinnises are busy with life, preparing for Christopher's all-star baseball game. Teammates consider Christopher's sister a good luck charm as she blows them kisses. Christopher hovers in center field, glimpsing Laura as she tromps through orange clay, restless, smiling, happy. It's in those small moments, when Laura's face is filled with laughter and light, that hope emerges from shadows, and the future looks strong and bright and sure. "If Laura died tomorrow, I've had everything," Frankie said. "I believe in heaven. I believe when she dies she will go to another place. I spend a lot of time at the altar. "I won't ever hear her cry again. I won't ever have to give her shots. Then she'll be just like everybody. She'll be able to go outside and play like a kid. That give me peace."